I watched both Saturday and Sunday night's Match Of The Days and amid the one-too-many action replays and so-what analysis, it dawned on me: what a load of bloody rubbish most of the Premier League is becoming! And it was so apparent this week with none of the big four playing till Sunday. Adrian Chiles' MOTD2 led with two of the most enticing fixtures of the season, Chelsea against Arsenal and the Manchester derby, Robinho v. Ronaldo. Neither disappointed. The brilliant van Persie put Blues to the sword in minutes, and Ronnie's Red Card for handballing a corner only builds his myth as one of football's great entertainers! But Gary Lineker's Saturday Obligation hobbled on for hours starring Villa's latest goalless failure to break the top three by beating a London suburb and Boro and Newcastle's local difficulty so dull I doubt it'll even make their local backpages. As for Sunderland, Roy Keane looked as lost Mark Thatcher on a Matzo Ramble, making Bolton look far better than they are. The falling standard below about sixth place is rather like watching an ageing fat man who can't keep his expanding waistline inside the straining belt of his trousers. In other words, the lean quality is concentrated more and more to the top of the league with gravity taking care of the flabby bits after years of neglect. Clubs lower down are employing journeymen and have-a-go managers making a virtue of their also-ran incompetence - purely because it's badged as Premier League. No wonder attendances are down. It's not just the recession. The entertainment's not worth the entrance fee. We can all jump round the room lauding marvellous Hull City's Premier League sortees - but their draw at Stoke was a catalogue of route one, long throws, gamesmanship and a stadium full of Championship fans who know the party can't last. It's crap and seasoned-watchers aren't fooled. Once upon a time when money and power wasn't concentrated to the perennial Champions League qualifiers, the riches of the new league filtered through so that even Middlesbrough got to sign Ravanelli and Juninho, Shearer fulfilled his boyhood dream of playing for Newcastle and Fulham signed van der Sar. None of that happens these days. The Premier League's summit is a protectionist racket - and the only thing that stops it from being a cartel is that the standard is so universally ordinary at the wrong end that even newly promoted clubs can stay up. In other words, anyone of the bottom eight could be relegated. The Premier League came about after years of in-fighting and attempts at reorganization, and it worked spectacularly. 1) Distribution of Champions League revenue would do the trick. 3) a draft system where the best European teenagers don't always end up at The Emirates. A pro-active rethink is needed - otherwise the Premier League's star may fall. As Cristiano Ronaldo limbers up to garner every world player gong around, the manner of his display coupled with his sheer desire to face Villareal in the Champions League suggests he's about to unleash himself again. It's been a truncated term so far for Ronaldo; the weight of expectation on his shoulders has proved unforgiving of his recovery from surgery and his summer job for Portugal. So allegations that his head's already in Madrid have been far too easy for the pundits to make. 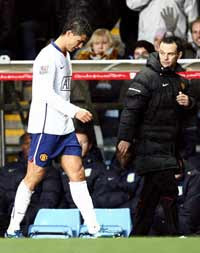 Euro 2008 offered no respite followed up by frustrating months recovering from an ankle operation. Comparing his first dozen outings to The Season? well, it's plain short-sighted. Ronaldo's feats in scoring 42 goals, winning the Premier League, the Champions League and the Golden Boot is a tough act to follow. But he will. Don't believe me? Ask Fernando Torres. "What he did last season is incredible. No-one can rival him," the Spaniard told France Football. "He is in a class of his own. For me he is the best player in the world. A machine. Incomparable." gushed the Liverpool hitman. His superhuman show last term simply created a rod for his back but reports of his United demise are as overstated as the Brown Bounce. His desire to feature at Villareal after limping out of Saturday's stalemate at Villa is a measure not just of his character - but a sign of an inate confidence that he's working his season back into gear. Ron played with trademark courage, targeted as he was by the home team and their fans, a victim of a drastic foul by Capdevila which deserved the straight red. His body language, the straight-arched back after his half-volley was deflected against the crossbar revealed all: Ronaldo's humming toward to the top of his game and he knows it. He ran a bit of temperature on Wednesday night, but who better than Sir Alex Ferguson to channel that fire in his belly to more positive ends as the race for honours intensifies? Wheeling round the world snaffling up badges every 10 days in James Bond Bib and Tucker will also aid his feeling of well being too. You watch: Ronaldo's back - and back for United. Madrid will have to wait. Despite global ecomonic woes, this January's transfer window could be as financially explosive as ever. Saturday's Times (22/11/08) reports Manchester City are preparing a world record £50million bid for Juventus' Gigi Buffon, widely regarded as the planet's best goalkeeper. Even his wages could break all barriers and City set a new bar only two months ago, paying Robinho £160,000 a week to choose Eastlands over Stamford Bridge. As the best laid plans of mice and men go oft awry, clubs are vying with each other to gain that competitive edge. Liverpool may be toe-to-toe with Chelsea at the top, but have they got enough in reserve to maintain the challenge? Manchester United are unexpectedly adrift and Arsenal's prospects seem akin to John Sargeant's plans to setup a dance school. 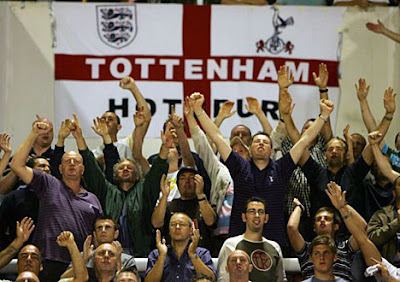 For all of the flag waving at Tottenham's turnaround, Harry Redknapp's charges are still in danger of the drop. Aston Villa were among the summer's big-spenders but Martin O'Neill might well judge another few million might be needed to bag the Champions League dream. But it doesn't have to be like that. The cash needn't have to fly out the coffers, Alastair Darling-style. There's enough proven world-class quality in the Premier League going cheap. 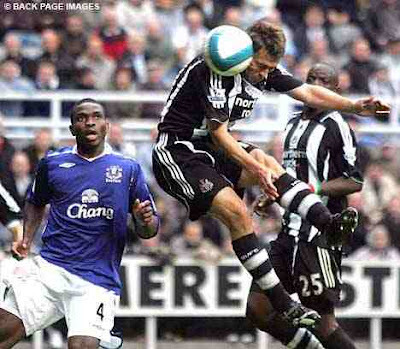 Who's going to rescue Michael Owen from Newcastle United? At 29 next month, no one's going to tell me his best days are behind him. Even lacking match fitness, you always fancy him to bag a goal. Chelsea and Aston Villa both know it. Owen coming off the bench for either of those clubs would more than serve their season's remaining ambitions. Would £5million cover it? Probably . And then there's William Gallas, stripped of the responsibility of captaining Arsenal, the Frenchman remains one of the world's best defenders. He was imperious under Jose Mourinho at Chelsea and he's not been bad at Arsenal either. Arsene Wenger and Gallas are miles apart but that doesn't mean a new manager with a new club wouldn't whisper different sweet nothings in his ear on matchday. If Harry Redknapp were still at Portsmouth, you could well imagine Gallas going to Fratton Park. 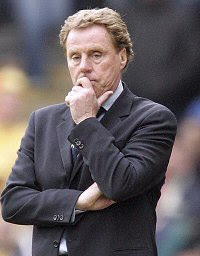 Redknapp's a master of re-focusing and motivating the misfit to former glory. Harry took Paolo di Canio to West Ham after his refereeing shove ha'penny at Hillsborough, and he tempted Sol Campbell from Arsenal (via Bruges). Perhaps he told Sol that as Portsmouth was by the coast, it'd be easy to Lunn Poly when he needed to. 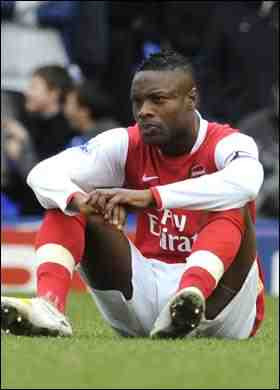 But would the Gunners be tempted to sell Gallas to Tottenham of all clubs? The fact remains that if you needed a quality defender with a proven Premier League record, you'd never find anyone cheaper than Gallas at the moment. Like Citigroup, his stock is down. What a potential bargain. Even David Dickinson might be interested. Then there's goalkeepers: I can't remember a higher standard of stoppers in the history of the Premier League. Manchester City's Abu Dhabi Babby may have a fiscal point to prove or a splash-da-cash deathwish as he limbers up for Fantasy Football Window. But is Buffon that much better than Shay Given, David James and Jussi Jääskeläinen? They've all been Premier League stars for over a decade and none of them would cost even 10 percent of the total funds to secure the Italian. Imagine Mark Hughes or Harry Redknapp having any problems integrating them into their club? I'd put the Buffon brochure back on the shelf if I were you, Babby. Changing times demand a different outlook. There's real quality misplaced in the Premier League and it's available for record low transfer fees. Managers may ponder recycling homegrown talent instead: it may well get their team further as the race for honours heats up in the second half of the season. 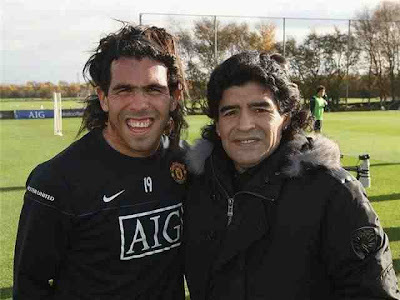 Tevez's mum visits United's training ground! Even with all the pre-match tension of Argentina's square-up to Scotland this week, there was still some R&R time for Manchester United's Argentine striker, Carlos Tevez. His mum popped into United's training HQ at Carrington to see if Carlito was eating his greens! Tevez's mum now has an unassailable 100% record as an international manager, so on the basis that the only way is down, maybe it's time to quit and concentrate on cooking young Carlos some parrilla and asado in the keeetcheen! No takers for Everton. Liverpool in financial danger. The Premier League promises to look very different in the future. Everton chairman Bill Kenwright instructed Harris of merchant bank, Seymour Pierce, to find new investors after admitting the club couldn't keep borrowing. They've yet to finance the new stadium at Kirkby. Harris is concerned that the Reds' huge £350million debt with two stricken banks Wachovia and RBS, are due for repayment in January. They've an option to renew for another six months - but time is running short for Liverpool owners Messrs. Hicks and Gillett, to transfer the debt from done-for banks to other super-rich individuals. Who couldn't have been immensely impressed by Wenger's kids mashing up all before them in the League Cup this season? And by the time they're 21-year-old first-teamers, Liverpool's debt will have been re-structured and some of their best players may have been sold off. Arsenal with only £260million of debt, and that to pay for the Emirates (at 5% per annum) are so well-poised to dominate. That's "good debt" compared with other big three. Huge matchday revenues, increased sponsorship opportunities and secondary rights sales. Looking good, Arsenal. I take them to win the title either next season or definitely the year after! And once they do, they can dominate for a while. 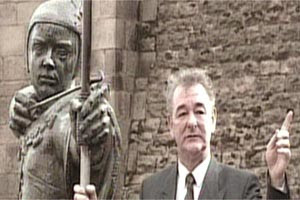 In the spirit of Brian Clough, the sport may be about to become much more competitive. As football fans, we can all raise a glass to that! Sir John Harvey-Jones meets Harry Houdini! Harry Redknapp's overnight arrival and resurrection of Tottenham stands alongside Hull City as the story of the season so far. After jumping ship at Fratton, steering Spurs to their first league win, earning a miraculous point at Arsenal, coming-from-behind to topple leaders Liverpool to treble their points tally - then mashing it up in Europe, there's a lesson to be learned for other wannabe clubs. The clue to Tottenham's amazing turnaround lies in Harry being English. Because if Tottenham aspire to being a Big Four club, they'll be wise to remember they're not there yet - neither do they compete at that level in any way. Chelsea, Liverpool and Arsenal qualify annually for the Champions League; that's their ambition, platform and community. The players they compete for and the teams they must beat are of a different gravy altogether. A foreign coach and setup is how they must operate. And while Mark Hughes and Roy Keane are Fergie's heir-apparents, I'm sure Manchester United will be thinking long and hard about employing a foreign coach before crowning a former United playing hero. But for Spurs and that matter Villa and Man City, it's a different play in the English arena. If they're lucky, those clubs'll grab a UEFA Cup place as they improve. A British coach is frankly what's required with their opponents and the players they go for in the transfer market. Furthermore, as their football outlook is more provincial, employing a British coach helps embody the spirit of the terraces. Birmingham's football public is an English, Welsh and Irish mix, so who better than Martin O'Neill to personify that spirit? If Spurs fans relate to Harry, it helps unite them behind the team. Harry is a n eastender made good. Juande Ramos and a Director of Football was an appointment for when they made the Champions League - not as they aspired to it. Being a perennial Champions League club is very different from an also-ran and the decision to go continental is as clear as whether you eat from that top table or whether you're looking in at it. The day Spurs appointed Redknapp was the day that Spurs understood who they were. That's why Harry's unlocking this group of talented players so instantly.